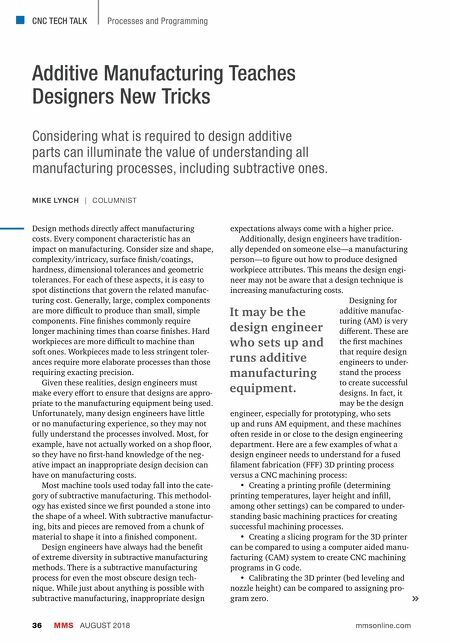 CNC TECH TALK MMS AUGUST 2018 36 mmsonline.com Processes and Programming Additive Manufacturing Teaches Designers New Tricks MIKE LYNCH | COLUMNIST Considering what is required to design additive parts can illuminate the value of understanding all manufacturing processes, including subtractive ones. Design methods directly affect manufacturing costs. Every component characteristic has an impact on manufacturing. Consider size and shape, complexity/intricacy, surface finish/coatings, hardness, dimensional tolerances and geometric tolerances. For each of these aspects, it is easy to spot distinctions that govern the related manufac- turing cost. Generally, large, complex components are more difficult to produce than small, simple components. Fine finishes commonly require longer machining times than coarse finishes. Hard workpieces are more difficult to machine than soft ones. Workpieces made to less stringent toler- ances require more elaborate processes than those requiring exacting precision. Given these realities, design engineers must make every effort to ensure that designs are appro- priate to the manufacturing equipment being used. Unfortunately, many design engineers have little or no manufacturing experience, so they may not fully understand the processes involved. Most, for example, have not actually worked on a shop floor, so they have no first-hand knowledge of the neg- ative impact an inappropriate design decision can have on manufacturing costs. 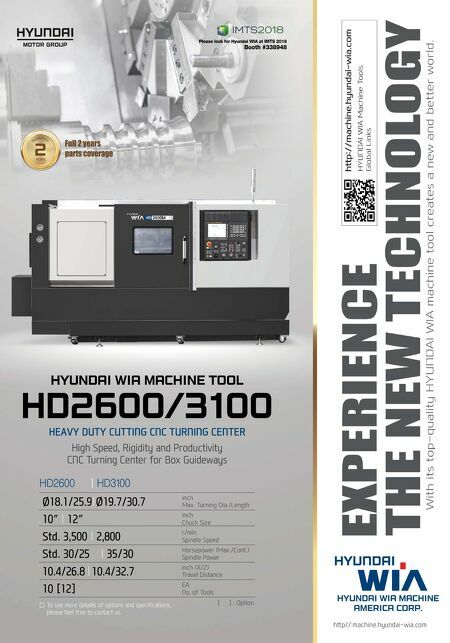 Most machine tools used today fall into the cate- gory of subtractive manufacturing. This methodol- ogy has existed since we first pounded a stone into the shape of a wheel. With subtractive manufactur- ing, bits and pieces are removed from a chunk of material to shape it into a finished component. Design engineers have always had the benefit of extreme diversity in subtractive manufacturing methods. There is a subtractive manufacturing process for even the most obscure design tech- nique. While just about anything is possible with subtractive manufacturing, inappropriate design expectations always come with a higher price. Additionally, design engineers have tradition- ally depended on someone else—a manufacturing person—to figure out how to produce designed workpiece attributes. This means the design engi- neer may not be aware that a design technique is increasing manufacturing costs. Designing for additive manufac- turing (AM) is very different. These are the first machines that require design engineers to under- stand the process to create successful designs. In fact, it may be the design engineer, especially for prototyping, who sets up and runs AM equipment, and these machines often reside in or close to the design engineering department. Here are a few examples of what a design engineer needs to understand for a fused filament fabrication (FFF) 3D printing process versus a CNC machining process: • Creating a printing profile (determining printing temperatures, layer height and infill, among other settings) can be compared to under- standing basic machining practices for creating successful machining processes. • Creating a slicing program for the 3D printer can be compared to using a computer aided manu- facturing (CAM) system to create CNC machining programs in G code. • Calibrating the 3D printer (bed leveling and nozzle height) can be compared to assigning pro- gram zero. It may be the design engineer who sets up and runs additive manufacturing equipment.